For the recent WordPress Photo Challenge with the motto “Repurpose”, I have chosen a photo from my library that I shot in Reinfeld. If you walk around the pond that is called Herrenteich, you will enjoy the nature but at some point you reach the town and there is no way that you will miss the sculpture that you see in my picture. The first time I walked around the pond I thought “Wait, isn’t this a sculpture of the character Scrat from the movie Ice Age?” and I laughed. I researched and there is a person that locally supports art, and if you speak German you can read a news article about it here. They basically created a “Skulpturenpark”, that translates to sculpture park. But I am honest with you, I can’t remember the other sculptures, the Scrat figure was the most eye-catching sculpture but I say that as someone who is not into sculpture art and maybe I didn’t pay attention to the other ones. By the way, credit where credit is due, the sculpture was created by Peter Gatzlaff from Buchholz in Germany. 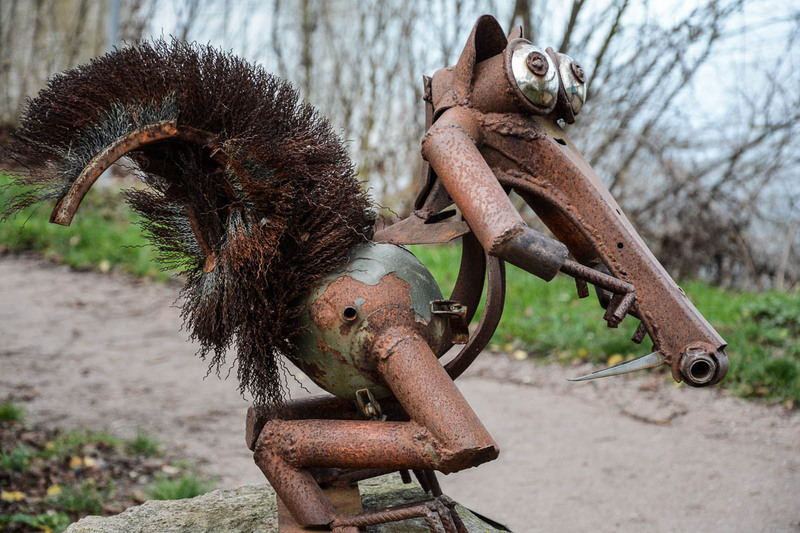 Looks like he creates art from scrap metal, and I just found out right now that it’s worth to check the gallery on his website, just click on Kunstobjekte (Art objects) on his site. That’s really funny art, some sculpture are even cute, I like that! This made me laugh. What a fun piece of art.